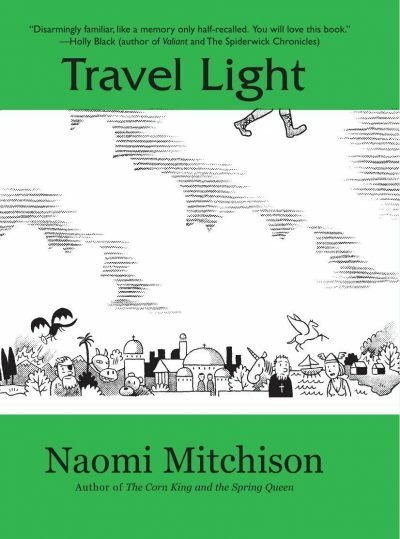 Naomi Mitchison’s 1952 Travel Light is a standalone fantasy. A widowed king remarries. His new wife may have many virtues, but love for her stepdaughter Halla is not one of them. Eager to please his new bride, the king orders his daughter Halla cast out in the wilderness to die. This should have been the end for Halla. It wasn’t. Halla’s father is short on basic human decency, but Halla’s nurse Matulli is not. She whisks the baby off to the forest. Matulli is from Finmark and like so many people from that region, she is sometimes a bear. Keeping Halla alive in the forest is well within her abilities. At least for a time. As winter approaches, Matulli realizes that while bears hibernate, humans do not. Some other home will need to be found for Halla. That home is with the dragon Uggi, who is taken with the idea of adding golden-haired Halla to his hoard. Uggi treats Halla as solicitously as he would all his treasures:, fire-proofing and then educating her. Indeed, the great worm is so kind to Halla that it takes her a while to realize that she is not herself a dragon. Human-dragon relationships are complicated by humanity’s failure to understand their place in the world. They are reluctant to share princesses and wealth with dragons. They are much too prone to attempted dragon-killing. Poor Uggi falls foul of these human tendencies. He sets out for treasure, is wounded, and is tracked back to his lair. Finis Uggi. Halla finds herself alone in the world, armed only with her fine dragon education and her natural wit. Oh, and one-eyed Odin’s attention, if that can be said to be an asset. This edition has a lengthy introduction that should have been an afterword. Save it until after you’ve read the book. I don’t know if I knew this before and forgot or simply never knew it but Mitchison wasn’t just a friend of J. R. R. Tolkien’s, but also one of the people he asked to proofread Lord of the Rings. This book is nothing like LOTR (which it predates) or even The Hobbit but having read it, I can see why Tolkien would have valued Mitchison’s views on fantasy. Halla’s life is one of constant change. Her mother dies, her father rejects her, her nurse saves her and hands her off to a dragon, the dragon is killed. Halla learns all too early that nothing lasts, that friends and guardians come and go. Raised by a dragon, Halla has what may appear a skewed view of justice and righteousness (dragons are not much concerned with the fine points of meum and tuum). Once Halla ventures out into the human world, she finds that dragons do not have a monopoly on self-serving naïveté. Humans are just as prone to see anything that serves their ends as obviously right. There can be no human community for Halla. So in the end … but that would be telling. All of the above sounds like this should be an enormous downer of a book and yet, somehow it is not. In fact, this is the most delightful discovery of 2019 thus far, and it’s not been a bad year for books. I wonder why on Earth I overlooked this novel, and this author, for so long. Travel Light is available here (Amazon), here (Amazon.ca) and here (Chapters-Indigo). Mitchison is a fascinating historical figure as well as a sadly neglected writer. As well as her WW2 diaries “Among You Taking Notes” are a great read. I guess she’s a bit overshadowed by her elder brother, JBS Haldane but she is very noteworthy in her own right. Her books are not the easiest to find on this side of the Atlantic but I have run across a few in the last 40-some years, and none have disappointed me. They were all historical novels, though those were only a small part of her vast output. The Corn King and the Spring Queen in particular impressed the heck out of me. The Conquered, set during the Roman conquest of Gaul, is very good. Next to it on the the library shelves was Blood of the Martyrs, and normally a book with a title like that is not something that I would ever bother to open. But I gave it a chance based on the strength of the others and when I finished it I found myself thinking, “You know, it might actually have been something like that,” (early days of Christianity in Nero’s Rome. She was the goods. @Roy I note that her brother, JBS Haldane also wrote just one fantasy My Friend Mr Leakey so maybe a review of that? The Mr. Leakey stories are not a novel. Perhaps they were collected as a fixup? A teacher read the first one to our class when I was young, and for years after, it was a lost story that I could never find. When the Internet became a thing, I found them online and read all of them. Unfortunately, the racism fairy hit the later ones very hard, though I still remember the first story as charming. Only published as a story collection. a book for children titled My Friend Mr Leakey (1937), containing the stories "A Meal With a Magician", "A Day in the Life of a Magician", "Mr Leakey's Party", "Rats", "The Snake with the Golden Teeth", and "My Magic Collar Stud"; later editions featured illustrations by Quentin Blake.